Posted on May 22, 2013 | 1703 views | Topic : Property News. Work in progress: The project is currently about 70% completed. MOTORISTS using Lebuhraya Thean Teik on Penang island can enjoy a smoother journey in two months. 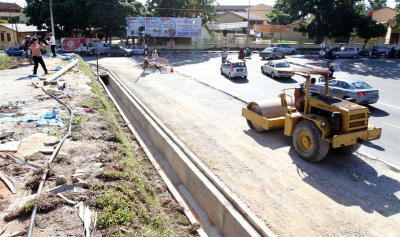 This is following the completion of a road widening project which started in March. Air Itam assemblyman Wong Hon Wai said the project encompassing 350 metres was about 70% completed. Wong said the road, used by residents of Bandar Baru Air Itam, Air Itam and Paya Terubong, was being widened from 18.3m to 30.5m. “The existing two lanes on each side will be converted into three lanes each to facilitate a smoother traffic flow from the Lebuhraya Thean Teik-Lorong Batu Lanchang traffic light junction to Kim Eng Temple,” he said during a site visit yesterday. Wong said the project is being undertaken by developer Jiran Bina Sdn Bhd following a condition imposed by the state government and Penang Municipal Council on the company which was undertaking a housing project along Lebuhraya Thean Teik. Wong said about 2,300 vehicles use the road per hour during morning peak hours while 1,500 vehicles use the stretch during evening peak hours based on council statistics. He added that work to widen another stretch of Lebuhraya Thean Teik was completed in February last year and the project was undertaken by the Belleview Group. Wong added that in his second term as the assemblyman, he would closely monitor the implementation of the proposed 4.6km Lebuhraya Tun Dr Lim Chong Eu-Bandar Baru Air Itam bypass project. “It is still in a planning stage. The project will be a long term solution to resolve traffic congestion in the area,” he said.